"The IRS is working to develop withholding guidance to implement the tax reform bill signed into law on December 22. We anticipate issuing the initial withholding guidance in January, and employers and payroll service providers will be encouraged to implement the changes in February. The IRS emphasizes this information will be designed to work with the existing Forms W-4 that employees have already filed, and no further action by taxpayers is needed at this time. Use of the new 2018 withholding guidelines will allow taxpayers to begin seeing the changes in their paychecks as early as February. In the meantime, employers and payroll service providers should continue to use the existing 2017 withholding tables and systems". According to this IRS statement, employers can continue to use the current 2017 federal tax rate for 2018 paychecks right now. However, many states released the new 2018 state tax tables. Employers need to use the new 2018 state tax tables for 2018 paychecks. ezPaycheck payroll software clients and ezAccounting software clients can update software to use the latest 2018 state tax tables for 2018 payroll. Usually employers need to withhold Social Security tax from employees’ paychecks. The Social Security tax is a payroll tax that was started by the United States Government in the 1930s. This tax is imposed upon working people and their employers. The 2015 tax rate for Social Security is 6.2% for the employer and 6.2% for the employee, or 12.4% total. The maximum wage that is subject to the tax for year 2015 is $118,500. Refer to Publication 15, (Circular E), Employer's Tax Guide, for more information; or Publication 51, (Circular A), Agricultural Employer’s Tax Guide, for agricultural employers. Both ezPaycheck payroll software and ezAccounting software can calculate Soecial Security tax and other payroll taxes automatically based on current tax table. According to IRS, gross income means all income you received in the form of money, goods, property, and services that is not exempt from tax, including any income from sources outside the United States or from the sale of your main home (even if you can exclude part or all of it). Gross income is the starting point for determining Federal and state income tax. As a business owner, it is not uncommon you hire some employee that has some sort of wage garnishment on their earnings. Wage garnishment is a legal procedure in which a person’s earnings are required by court order to be withheld by an employer for the payment of a debt such as child support. Title III of the Consumer Credit Protection Act (CCPA) prohibits an employer from discharging an employee whose earnings have been subject to garnishment for any one debt, regardless of the number of levies made or proceedings brought to collect it. ezPaycheck payroll software comes with the flexible features and you can add a new custom deduction fieldly easily for wage garnishment. You can deduct it from ezPaycheck automatically by the fixed amount or by percent. Small Business Payroll Solution: How to Handle SDI Tax? ezPaycheck payroll software is very flexible. With ezPaycheck, user can easily add a new deduction to handle SDI Tax, IRA plan, Garnishment, Donation, Dependent Care, Flexible Account or other local taxes. 1. Start ezPaycheck, click the left menu “Company Settings->Deductions” to open Company Deduction Setup screen. 2. 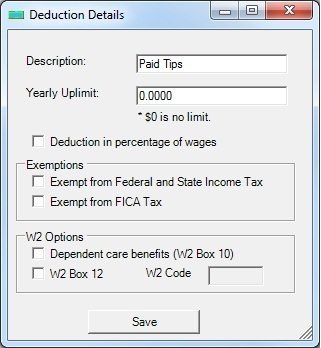 Check one Customized deduction item, then clicked the button behind it to open Deduction Details sceen. 3. Input the new name "SDI" for the Description field. 4. If this is a deduction by percent, you can check "Deduction in percentage of wage" option box and enter the value. Otherwise, leave it unchecked. You also need to enter the uplimit for this deduction. 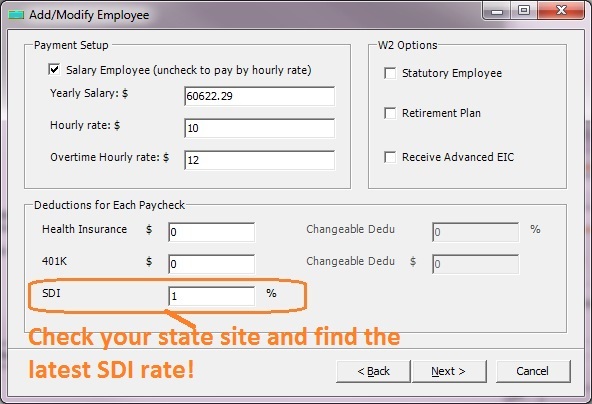 For example: The 2012 CA SDI tax rate is 1.0 percent (.010) of SDI taxable wages per employee, per year. This includes the rate for PFL. The maximum tax is $955.85 per employee, per year. 6. Click the "Save" button and closed Deduction details page. 7. Click "save" button on Company Deduction Setup form to update the database. 1. Select one employee from employee list and edit his deduction option. 2. Enter the amount or percent value. 3. Click "next" until the last page, then click the "Finish" button to save the change. More information about ezPaycheck payroll software can be found at product page. · The Temporary Payroll Tax Cut Continuation Act of 2011 temporarily extends the two percentage point payroll tax cut for employees, continuing the reduction of their Social Security tax withholding rate from 6.2 percent to 4.2 percent of wages paid through Feb. 29, 2012. The employer tax rate for social security remains unchanged at 6.2%. The IRS asks that employers should implement the new payroll tax rate as soon as possible in 2012 but not later than Jan. 31, 2012. Designed with non-accountant business owners and managers in mind, the new ezPaycheck 2012 payroll software is released to help small businesses and accountants to handle the latest tax changes easily and smoothly. FICA stands for the Federal Insurance Contributions Act. FICA taxes are comprised of two separate taxes, social security and Medicare taxes, that are paid on wages earned for services performed. Employers withhold and pay their employees’ share of the FICA taxes and also pay the employer share. For Year 2011, the maximum taxable earnings amount for Social Security is $106,800. The Social Security tax (OASDI) rate for wages paid in 2011 is 4.2 percent for employees and 6.2 percent for employers. The Medicare Taxes Rate is 1.45% for both employers and employees. What Is Social Security Tax? The Social Security tax is a payroll tax that was started by the United States Government in the 1930s. This tax is imposed upon working people and their employers. For 2011, the maximum taxable earnings amount for Social Security is $106,800. The Social Security tax (OASDI) rate for wages paid in 2011 is 4.2 percent for employees and 6.2 percent for employers. For example, an individual with wages equal to or more than $106,800 would contribute $4,485.60 to Social Security in 2011. The employer would contribute $6,621.60. The purpose of Form 941-X is to correct errors on a Form 941 that you previously filed. - Social security tax rate for 2011. The employee social security tax rate is 4.2% and the employer social security tax rate is 6.2% (10.4% total). Be sure to use the correct rate when correcting amounts reported on lines 8 and 9. - Section 3121(q) Notice and Demand—Tax due on unreported tips. A new line has been added to Form 941 for reporting social security and Medicare taxes on unreported tips. An employer now reports the amount of the taxes shown on the Section 3121(q) Notice and Demand on line 5e of the employer's Form 941 for the calendar quarter in which notice and demand is made. Any errors discovered on previously filed Forms 941 for these taxes are corrected on line 11 of Form 941-X. In addition, any errors relating to Section 3121(q) Notice and Demand amounts reported on line 7c of Form 941 (for quarters ending before January 1, 2011) should be corrected on line 11 of Form 941-X. - Qualified employer's social security tax exemption expired. The qualified employer's exemption for their share (6.2%) of social security tax on wages/tips paid to qualified employees expired on December 31, 2010. Any errors discovered on previously filed Forms 941 (for quarters ending after March 31, 2010, and before January 1, 2011) for this exemption are corrected on lines 12a–12c of Form 941-X. - Advance payment of earned income credit (EIC). The option of receiving advance payroll payments of EIC is no longer available after December 31, 2010. Corrections to advance payroll payments of EIC made before December 31, 2010, can be made on line 18. Many Connecticut wage earners will notice their paychecks shrinking faster than anticipated starting this August, when the Department of Revenue Services begins implementing the new $875 million state income tax increase. That's because the tax hike, which adds three new tax rates, reduces a property tax credit and adds an earned income credit for poor families, is retroactive to Jan. 1, but won't be drawn from paychecks until August. That means the state's tax agency, which released new withholding tables this week, has five months to collect 12 months' worth of tax obligations. For the 22 weeks between Aug. 1 and Dec. 31, the additional withholding will be about 2.4 times the increase that will be applied starting in January 2012. Tips your employees receive from customers are generally subject to withholding. Employees are required to claim all tip income received. This includes tips you paid over to the employee for charge customers and tips the employee received directly from customers. The employee's name, address, and SSN. The month or period the report covers. No report is required from an employee for months when tips are less than $20. Employers must collect income tax, employee social security tax and employee Medicare tax on tips reported by employees. You can collect these taxes from an employee's wages or from other funds he or she makes available. As an employer, you must ensure that the total tip income reported to you during any pay period is, at a minimum, equal to 8% of your total receipts for that period. In calculating 8% of total receipts, you do not include nonallocable receipts. Nonallocable receipts are defined as receipts for carry out sales and receipts with a service charge added of 10% or more. Note: The amount shown as allocated tip income is for information purposes only. You are not required to withhold Income or Social Security taxes on the allocated tip income. The amount of tip income allocated to each employee is shown in box 8 of their Form W-2. More than 10 employees, who work more than 80 hours, were normally employed on a typical business day during the preceding calendar year. I would like to recommend this article. It explains why rich people can avoid the taxes without high-priced lawyers under our current tax system. While the Republicans talk about the "shared sacrifices" necessary to close our government's budget deficit, their plan imposes pain mostly on the sick, the elderly, and the poor. Asking the rich to sacrifice by paying higher tax rates surely pales in comparison. I believe that having wealthy investors pay taxes at the same rate as middle-class workers would be an important step towards making sure that we all contribute to putting our fiscal house in order. IL, CO, HI, IN,ME, MD, MN, MO, NM, ND, OK, RI, VT published the new state tax tables. Your Form 941 is due by the last day of the month that follows the end of the quarter. Can you believe halfpricesoft.com paid more taxes than ExxonMobil, Bank of American and GE? Read this article. Is there any totally free payroll software? I do not know if there is totally free and reliable payroll software in market. But I know it is not an easy job for our programmers to keep our tax tables and forms up-to-date. Based on my experience, when you are using free software you normally get what you paid for. Free payroll software can end up the most expensive if it fails to give accurate and current data. However it is always a good idea to download and try payroll software for free before purchasing. Each company is unique. The best way to know if a payroll software works for you is to use it. That is why we offer users 30-day free trial. What Is New Of Year 2011 Form 941? Social security and Medicare tax for 2011. The employee tax rate for social security is 4.2%. The employer tax rate for social security remains unchanged at 6.2%. The Medicare tax rate is 1.45% each for employers and employees. Do not withhold or pay social security tax after an employee reaches $106,800 in social security wages for the year. There is no limit on the amount of wages subject to Medicare tax. Qualified employer’s social security tax exemption expired. The qualified employer’s exemption for their share (6.2%) of social security tax on wages/tips paid to qualified employees expired on December 31, 2010. COBRA premium assistance credit. The credit for COBRA premium assistance payments applies to premiums paid for employees involuntarily terminated between September 1, 2008, and May 31, 2010, and to premiums paid for up to 15 months. See COBRA Premium Assistance Payments on page 7. Advance payment of earned income credit (EIC). The option of receiving advance payroll payments of EIC is no longer available after December 31, 2010. Individuals eligible for EIC in 2011 can still claim the credit when they file their federal income tax return. Individuals who received advance payments of EIC in 2010 must file a 2010 federal income tax return. Federal tax deposits must be made by electronic funds transfer. Beginning January 1, 2011, you must use electronic funds transfer to make all federal tax deposits (such as deposits of employment tax, excise tax, and corporate income tax). Forms 8109 and 8109-B, Federal Tax Deposit Coupon, cannot be used after December 31, 2010. Generally, electronic funds transfers are made using the Electronic Federal Tax Payment System (EFTPS). If you do not want to use EFTPS, you can arrange for your tax professional, financial institution, payroll service, or other trusted third party to make deposits on your behalf. Also, you may arrange for your financial institution to initiate a same-day wire payment on your behalf. EFTPS is a free service provided by the Department of Treasury. Services provided by your tax professional, financial institution, payroll service, or other third party may have a fee. For more information on making federal tax deposits, see section 11 of Pub. 15 (Circular E), Employer’s Tax Guide (for use in 2011). To get more information about EFTPS or to enroll in EFTPS, visit www.eftps.gov or call 1-800-555-4477. Additional information about EFTPS is also available in Publication 966, The Secure Way to Pay Your Federal Taxes. Halfpricesoft has released the new version of ezPaycheck payroll software on latest 941 form (Year 2011). ezPaycheck is the easy-to-use and affordable payroll software for small business and non-accountants. ezPaycheck calculates payroll taxes automatically and supports check printing feature, forms 941, 940, W2 and W3. Following is the basic information about Form 941 - Employer's Quarterly Federal Tax Form. More information can be found from IRS site. Form 941- Employer's Quarterly Federal Tax Form is the form used by employers to report employment taxes , withholding amounts, deposit amounts, and amounts due to the IRS. Who Must File Form 941? Use Form 941 to report the following amounts. · Wages you have paid. · Tips your employees have received. · Federal income tax you withheld. · Both the employer's and the employee's share of social security and Medicare taxes. · Current quarter's adjustments to social security and Medicare taxes for fractions of cents, sick pay, tips, and group-term life insurance. · Advance earned income credit (EIC) payments. · Credit for COBRA premium assistance payments. · Exemption for qualified employer's share of social security tax on wages/tips paid to qualified employees. Do not use the Form 941 to report backup withholding or income tax withholding on nonpayroll payments such as pensions, annuities, and gambling winnings. Report these types of withholding on Form 945, Annual Return of Withheld Federal Income Tax. After you file your first Form 941, you must file a return for each quarter, even if you have no taxes to report, unless you filed a final return or one of the exceptions listed below applies. Special rules apply to some employers. Seasonal employers do not have to file a Form 941 for quarters in which they have no tax liability because they have paid no wages. To tell the IRS that you will not file a return for one or more quarters during the year, check the box on line 19 every quarter you file Form 941. See section 12 of Pub. 15 (Circular E) for more information. Employers of household employees do not usually file Form 941. See Pub. 926, Household Employer's Tax Guide, and Schedule H (Form 1040), Household Employment Taxes, for more information. Employers of farm employees do not usually file Form 941. See Form 943, Employer's Annual Federal Tax Return for Agricultural Employees, and Pub. 51 (Circular A), Agricultural Employer's Tax Guide. We have released the new version of ezPaycheck 2011 software. You can check your current version by clicking the top menu "help->about ezPaycheck" or "help->Check for updates". If you are using the old version and need to file form 941, you can download the new ezPaycheck 2011 update package. ezPaycheck 2011 update package is totally free for the current ezPaycheck 2011 users. If you are using ezPaycheck 2010 or earlier version, you need to purchase ezPaycheck 2011 key at $59. You can download and install the latest ezPaycheck package to update ezPaycheck by a few clicks. ezW2 software supports forms w2, w3, 1099 and 1096. It also save user money and time by printing the SSA approved laser substitute forms W2 copy A and W3 on the plain paper. ezW2 is compatible with Windows 7 system, 32-bit or 64-bit. It can run on Windows XP, Me, 2003 and Vista system too. 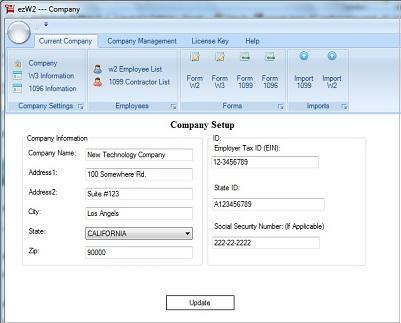 More controls and options in the new edition of ezW2 1099 and W2 filing software allow small business owners to better customize the software to fit their tax reporting needs and the way they work. 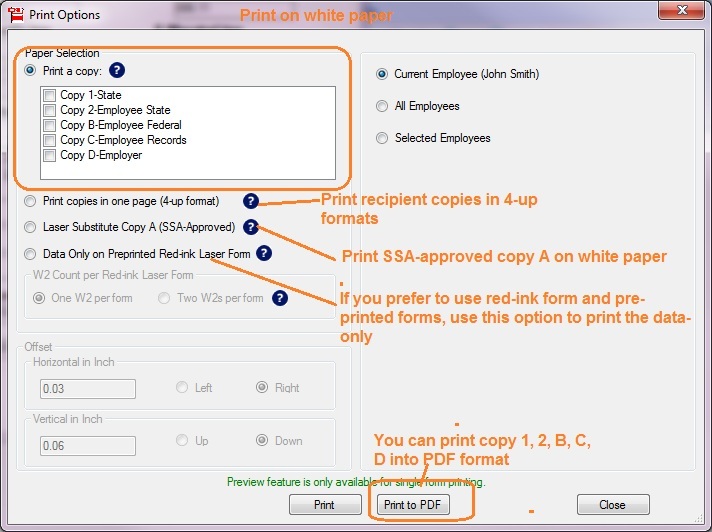 Followings are the 5 simple steps to printing form W-2. Step 1: Start ezW2 software. http://www.halfpricesoft.com/w2-software-free-download.asp. No registration needed and no obligation. You can follow the step by step online instructions to finish the installation in minutes. You can access this screen by clicking the top menu “Current Company->Company”. You need to enter the general company information for w2 and 1099 forms, such as Company Name, Address, Tax ID and others. You can access this screen by clicking the top menu “Current Company->W-3 information”. You need to enter the W-3 control number, W3 Establishment Number, Contact Information and others. This information will be displayed on both forms W-2 and W-3. You can access employee by clicking the top menu “Current Company->W2 Employee list”. You can add a new employee or edit or delete an existing one easily by clicking the link on this form. You can also import Employee information quickly by using W2 import form. You can access this import form by clicking the top menu “Current Company->Import W2”. 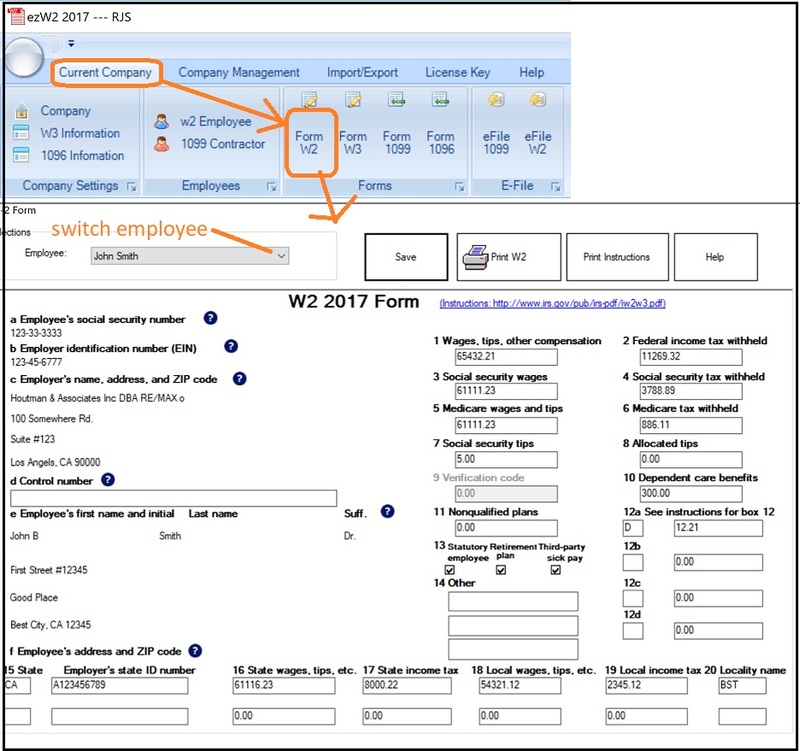 You can access this W-2 editing screen by clicking the top menu “Current Company->Form W-2”..
- Once you select the employee from the list, the employee information will be filled automatically. - Fill in the boxes on the w-2 Form. - Click the Question icon or the instructions link to get help. - Click the 'save' button to save the W-2 information. - Click the 'Print Instructions' button to print W-2 instructions. Can you believe it 51 million will take home less not more after Year 2011 tax cut? NEW YORK (CNNMoney.com) -- Despite a sweeping tax cut deal that is supposed to keep everyone whole financially, if not better off, 51 million households will face a higher tax bill or a lower refund compared with this year. The main culprit: a new payroll tax break that will not be as generous for many low- and middle-income households as the tax cut it is replacing. Here's why they won't get as much tax relief in 2011: Making Work Pay was worth $400 for individuals making $75,000 or less or $800 per couple making $150,000 or less. To get that much under the payroll tax break, one will need to earn at least $20,000 ($40,000 for couples). That's because the payroll tax break will amount to 2% of a worker's pay. Q: Is ezW2 for me? A: Yes, any businesses and accountants can use ezW2, which supports forms W-2, W-3, 1099 misc and 1096. Q: Does ezW2 support multiple companies? A: ezW2 can support unlimited companies, unlimited employees and unlimited contractors with no extra charge. Q: Can I try ezW2 for FREE? Q: What is the price of ezW2 2010? A: The basic version is $39 per installation, which supports unlimited companies, unlimited employees and unlimited contractors. The ezW2 PDF version is $64 per installation. Q: How can I purchase ezW2 2010? A: You can purchase ezW2 2010 online. The key will be sent to your email account after the transaction is done. Please feel free to contact us at services@halfpricesoft.com if you cannot receive it in 30 minutes. Q: Where can I purchase the red-ink forms w-2, w-3, 1099 and 1096? A: You can find the red-ink forms from our site. Free offers are available. Q: If I have ezW2 2009 installed on my machine, do I need to uninstall ezW2 2009 before installing ezW2 2010? A: No. EzW2 2010 and ezW2 2009 can coexist on your machine. Q: Can I copy my ezW2 2009 data to ezW2 2010? A: Yes, you can copy your 2009 database file to your 2010 application folder. 1. Install ezW2 2010 first. 3. Backup database file to ezW2 2010 folder by clicking the top menu "Company Management->Backup current company". 4. Select this new database file as your current database file by clicking the top menu "Company Management->Select Company". 5. You can edit your data there and print your new forms. President Barack Obama signed an $858 billion tax bill into law today, saying, "this is progress, and that's what (the American people) sent us here to achieve". President said, "Not only will middle class Americans avoid a tax increase, but tens of millions of Americans will start the New Year off right by opening their first paycheck to see that it's actually larger than the one they get right now." "Not only will middle class Americans avoid a tax increase, but tens of millions of Americans will start the New Year off right by opening their first paycheck to see that it's actually larger than the one they get right now." How to handle tips with ezPaycheck payroll software in restaurants? Restaurant payroll is very special because you need to handle tips. For example: You need pay your waitress $95, and her tip is $50. So you need to report $145 to the government. However, you just need to pay her $95 in the paycheck. Can ezPaycheck payroll software handle it? Yes, ezPaycheck can work for your restaurant payroll. In this case, you can add a customized deduction such as "Paid Tips" and deduct this amount from your paycheck. Click the left menu “Company Settings->Deductions” on left menu and open the Company Deduction Setup. Check one Customized deduction, and then click the button behind it to open Deduction Details form. Input "Paid Tips" as the new name. Click the “Save” button and closed Deduction details page. Click the "Save" button on Company Deduction Setup form to update database. After you add this deduction, you will see a new deduction field in your paycheck. When you generate a new check, you just need to enter your hourly pay, tips and paid tips. ezPaycheck will handle the taxes for you. As business owner, if you hire contractors, you need to furnish each contractor a completed Form 1099 by Jan 31. You also need file 1099-misc Copy A of all paper Forms 1099 with Form 1096, Annual Summary and Transmittal of U.S. Information Returns, with the IRS by Feb 28. Are you headache of the tax reporting now? For this tax season, you can take benefits from the features of ezW2, the easy-to-use 1099 & W2 printing software, which is trusted by thousands of users. ezW2 1099 W2 software was specifically engineered with non-accountant business owners in mind. Its intuitive interfaces allow the user to get started on filing and printing Forms W2, W3, 1099 and 1096 without the long learning curve typically associated with financial software. Followings are the 5 simple steps to printing form 1099. Step 1: Download and install ezW2. You can download this 1099 W2 software for FREE. No registration needed and no obligation. You can follow the step by step online instructions to finish the installation in minutes. You can access this screen by clicking the top menu “Current Company->1096 information”. You need to enter the filer name and contact information here. This information will be displayed on both forms 1099-misc and 1096. You can access contractor by clicking the top menu “Current Company->1099 Contractor list”. You can add a new employee or edit or delete an existing one easily by clicking the link on this form. You can also import contractor information quickly by using 1099 import form. You can access this import form by clicking the top menu “Current Company->Import 1099”. You can access this 1099 editing screen by clicking the top menu “Current Company->Form 1099”. - The payer information will be filled automatically. - Once you select the contractor from the contractor list, the recipient information will be filled automatically. - Fill in the boxes on the 1099 Form. - Click the 'save' button to save the 1099 information. - Click the 'Print Instructions' button to print 1099 instructions. Furnish Forms 1099 and W-2. Furnish each employee a completed Form W-2, Wage and Tax Statement. Furnish each other payee a completed Form 1099 (for example, Form 1099-MISC, Miscellaneous Income). File paper Forms 1099 and 1096. File Copy A of all paper Forms 1099 with Form 1096, Annual Summary and Transmittal of U.S. Information Returns, with the IRS. Deadline for filing electronic W-2s. halfpricesoft.com has extended the limited time special offer for customers who are planning to purchase small business payroll software during this holiday season. Users can purchase ezPaycheck 2010 and ezPaycheck 2011 Payroll Software bundle at $90. The regular price of ezPaycheck is $89. That means if users purchase ezPaycheck 2010 at the regular price, they can get ezPaycheck 2011 at just $1. Since ezPaycheck allows user to input YTD information, user can start to use this payroll software anytime. User can visit http://www.halfpricesoft.com/index.asp for more details. "We intentionally engineered this software for those end-users who are not professional accountants and payroll tax experts," explains Dr. Ge, President and Founder of ezPaycheck. "You don't even need to have much knowledge of computers. We believe small business software should be simple - stupid simple - so that owners can focus their time and energy on running their businesses, not trying to figure out how to run payroll software." Small business owners love ezPaycheck payroll software because it is simple and flexible to use, handles all their payroll needs and is very affordable. ezPaycheck payroll tax application is designed for use by non-accountants with minimal computer skills. However, even accountants like it because it is so flexible and supports unlimited accounts with one flat rate. In this era of increasingly sophisticated and pricey software, consumers are normally forced to purchase payroll and tax software in a bundle with other applications - and it costs a bundle of money. But according to Dr. Ge, that isn't fair to small businesses. "I do not think small business owners should have to pay for features they do not want and will never need to use," he says. "So we made ezPaycheck an easy-to-use stand-alone desktop application, not some big and complicated suite." - A sample company database so no configuration is needed. Just install the software and you're automatically ready to print the first sample check. - Prints your own payroll checks on blank computer checks or preprinted checks. - Automatically calculates Federal Withholding Tax, Social Security, Medicare Tax and Employer Unemployment Taxes. - Includes built-in tax tables for all 50 states and the District of Columbia. - Creates and maintains payrolls for multiple companies, and does it simultaneously. Thanks to this multi-tasking feature, ezPaycheck software is even used by professional accountants to help process multiple client workloads at the same time. - Supports Daily, Weekly, Biweekly, Semi-monthly and Monthly payroll periods. Features Report Functions, Print Functions, and Pay Stub Functions. -Supports Forms W-2, W-3, 1099, 1096, 940 and 941. - 30 day free trial. No registration required and absolutely no obligation. Even those who are not good at math can add "two plus two" and figure out that by offering software that is both inexpensive and "stupid simple" to use, the ezPaycheck company has created a revolutionary new product. or go to the video "ezPaycheck, the effective payroll solution"
How to move W2 1099 Software to a new machine? Step 1. Log in as the administor of the new machine. Download and install ezW2. Step 2: Backup your current database file from the old machine to the USB disk or shared folder. - Open ezW2 application on your old machine and insert your USB disk. - Click the top menu "Management->Backup current company", you will see the "Enter backup file name" form. You can click the triangle button behind "Save in" field to change the current path. You can modify the back up new file name as you like. - Once you click the Save button, you will save your current database file to the new location. Note: If you have multiple companies, you can copy all the database (.mdb) files from the application folder to the USB disk directly. - If you are using ezW2 2012 and later, you can use the new RESTORE function to copy your data. Click the top menu "Company Management->Restore Company", then select the target database file. - If you are using ezW2 2011 and earlier, you need to copy the database file to the application folder manually. Step 4. Select this new database file as your current database file by clicking the top menu "Company Management->Select Company". ezPaycheck payroll software received high reviews from CNET editors: "This is a simple yet effective and efficient check-printing and payroll management tool that includes some welcome extras in an easy-to-use package. With it, mom-and-pop shops can cut checks like the big boys." ezPaycheck is powerful and affordable payroll software for small businesses and accountants. ezPaycheck payroll software includes built-in federal and state tax tables. It supports hourly, salaried, bonus, sick, commission, tips and multiple user-defined income types and deductions. ezPaycheck can print payroll checks and forms W-2, W-3, 940 and 941. “Small businesses need all the breaks they can get, and anything that can reduce costs and increase productivity by automating a tedious process is welcome. HalfPriceSoft's ezPaycheck 2010 is a payroll management tool designed for small-business owners and accountants. It can manage payrolls for several companies, print checks and reports, and even calculate taxes and print tax forms. It includes tax data for all 50 U.S. states and Washington, D.C., as well as Social Security, Medicare, and FICA withholdings. The ezPaycheck interface is a simple, efficient dialog that opens with a split display, a sample check facsimile above a selection pane, and a basic left-hand navigation panel handles all settings and options with a series of configuration windows and dialogs. The program makes extensive use of wizards for setting up options, entering data, and other functions. We opted to simply print out the sample check to gauge how easy ezPaycheck is to use as well as the quality of its output. It delivered a crisp, professional-quality check image, including signature, as well as full balance information to our compact laser printer. Customizing checks is easy, too. The Check Setup dialog simplifies entering regularly accessed data, whereas the Check List displays your checks for easy selection. The New Check button calls up an extensive payroll data dialog. The Reports button accesses various annual and quarterly reporting options as well as data export wizards. We tried the W2 form tool, too, which automatically populated the form with appropriate data. You can even order professionally printed checks in quantity via an online link on the file menu. All told, it's a cinch to set up employee, payroll, and check data, save sample checks, and print out high-quality paper checks that can include signatures, images, and logos. We just released a new video on YouTube. 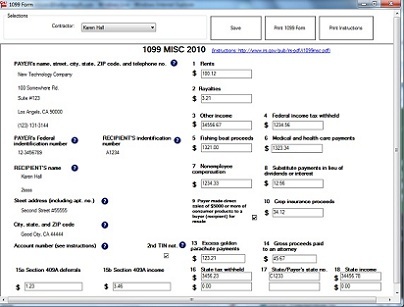 Title: Fast 1099-misc reporting solution. What to expect in 2011 Income taxes - Higher? What are the changes might happen on the coming 2011 online tax return software season? Try to analyze certain things regarding what to expect in 2011 income taxes. It can affect life of different people – small or big. not yet married that can earn $200,000 a year and married couples that can earn $250,000 a year. In no time, middle incomers can also experience this increase. that the economy is growing steadily at this point deficit can be the first priority so that debt can be unsustainable. • Marginal rates increased from 33% and 35% to 36% and 39.6%. • Increased capital gains and dividends – for those in the top brackets. Perhaps it can cause 20% rate or little bit higher. • President Obama maximizes the value of deductions at 28% and giving it to charitable groups plus he tries to curtail tax break until 2011. • No cancelled estate taxes, but if the exemption is $3.5 Million it can set to $5 Million if the Senate agrees. The estate legislation may include the spousal transfer and can make the exemptions to $7 Million or more for couples. • Increased SECA taxes for the owners of S firms and partnerships by disabling them in skirting of payroll taxes. • New classification for workers who are a real employee but treated as a contractor. • And for big corporations – elimination of tax breaks like domestic production deduction, depreciation acceleration, foreign income incentives and oil production. In no time tax hikes will make a collision to people especially businesses. Anyone can stay clear of this mess by just avoiding spending lots of money in Social Security, Medicare and Defense. Meanwhile, any individual who can earn $100,000 in a single year can be at risk for higher taxes. The special offers of ezPaycheck small business payroll software start today. It will end on Nov 30, 2010. If user like to purchase ezPaycheck 2010 version, you can get 33% off the regular price. The regular price is: $89. The promotion price is: $59. If user like to purchase ezPaycheck 2010 + ezPaycheck 2011 combo package, they can even save more. Quarterly Contribution Return and Report of Wages (Continuation) (DE 9C). For more information about 2011 payroll tax changes, please review the 2011 Payroll Tax Reporting Changes FAQs. What reporting changes are taking place in 2011? Effective January 1, 2011, employers will report total subject wages, Unemployment Insurance (UI) and Disability Insurance (DI) taxable wages and contributions, by filing a New Quarterly Contribution Return and Report of Wages (DE 9) quarterly instead of annually. Employers will continue to report employee wages and personal income tax withheld quarterly on the New Quarterly Contribution Return and Report of Wages (Continuation) (DE 9C). These forms will replace the Annual Reconciliation Statement (DE 7) and the Quarterly Wage and Withholding Report (DE 6). NOTE: Years 2010 and prior, employers will file the DE 7 and DE 6. How will changing from annual reconciliation to quarterly reporting impact employers? The new quarterly reporting process will allow the Employment Development Department (EDD) to identify overpayments sooner, which will result in faster refunds, as well as allow us to more quickly identify potential delinquencies. Will employers continue to use the Payroll Tax Deposit (DE 88) coupon to make payments? Yes, employers are still required to pay their contributions with the DE 88. Deposit due dates will not be affected by this change. In spring 2011, employers will have more options available to electronically file returns, and make deposits and payments on outstanding liabilities. Watch for additional information as it becomes available on our expanded e-Services for Business. What happens if a mistake has been made on the DE 7 or the DE 6? How do we correct the DE 9 or DE 9C? For years prior to 2011, employers will file a DE 7 and DE 6, therefore, any adjustments to either form would be done by filing a Tax and Wage Adjustment Form (DE 678). Corrections to the DE 9 or DE 9C can be made using the Quarterly Contribution and Wage Adjustment Form (DE 9ADJ). This form will be available online. Where can employers obtain the new forms? Registered employers will receive the new forms automatically by mail. They will also be available online and at local EDD offices in December 2010. The DE 6 and DE 7 will continue to be available online for years prior to 2011. NOTE: The expansion of our e-Services for Business in spring of 2011 will provide multiple options to file your returns electronically as well as make deposits. Watch for additional information as it becomes available on our expanded e-Services for Business. Will employers have to update their software to complete these new reports? The EDD will work directly with payroll software companies to make sure they are aware of the new reporting requirements. Employers and their representatives need to contact their payroll software company regarding software updates. Employers who file alternate forms need to contact the Alternate Forms Coordinator at (916) 255-0649. Boo! How to create the Halloween Style Bank Checks? Want to create a cool Halloween style check with ghost on it? Followings are the step by step guide on how to print your bank checks from your home printer in minutes at possible $0 cost. ezCheckPersonal runs on a machine with Windows system only. If you have a MAC machine, it will not work. This check printing and writing software supports Windows 98, Windows NT, Windows 2000, Windows 2003, Windows XP, Windows Vista and Windows 7. It supports both 32-bit and 64-bit operating system. Just follow the instructions on the download page to install this check writer. No registration needed and no obligation. You can try this software free for 30 days. Click the top menu "Settings->Edit Current Account" to open check setup page. Click the save button to finish the setup. Click the "New Check" button from the main screen to add a new check. Then you select this check from the list and print it by simply clicking the "Print Selected" button. Now your first check is ready from your printer. You can print blank pre-printed check by clicking the top menu "Print check->Print blank checks". Then you are ready to take your check with you and use them later. Each check you create is automatically saved and the program will keep track of check numbers so you will not accidentally use the same check number twice. No more forms W2 and 1099 year-end reporting headache. The new version of ezW2 2010 is shipping for the 2010-2011 tax season to simplify the process of W-2 & 1099 reporting for small businesses. All software from Halfpricesoft.com, including ezW2 2010, is designed to be incredibly easy to use. Customers can begin printing forms within minutes of downloading and installing the software. The intuitive graphical interface leads users step by step through forms w2, w3, 1099 and 1096 reporting process. "Small businesses need to be taking care of their customers without figuring out new software," said Dr. Ge. "We make our small business software simple, easy to install and use, so our customers can focus their time and energy in the right places." A leading provider of computer software to small businesses worldwide, Halfpricesoft.com engineered this w2 & 1099 software for business people – not just for accountants or payroll tax experts. When each calendar year ends, employers in the United States need to issue Form W-2 for each employee and Form 1099 for independent contractors. With ezW2 W2 1099 software, those forms can be printed on plain paper or red forms and are accepted by government agencies like the Social Security Administration. Such improvements come from suggestions from Halfpricesoft.com's customers. Customers continue to drive improvements to Halfpricesoft.com's ezW2 2010 software then now makes it possible to print W-2s and 1099s even easier and affordable. "We try to answer all customers' questions in the fastest way we can, usually within 24 hours. Our developing team records all customers' requests and reads them carefully. We believe our customers are the best members in our design team." said Dr. Ge. (4) Users save valuable time by importing employee data and contractor data from csv file - no need for users to enter the data one by one. (7) At $39, ezW2 is among the lowest priced, full-featured software available for small businesses. Founded in 2003, Halfpricesoft.com has established itself as a leader in meeting the software needs of small businesses around the world with its payroll software, employee attendance tracking software, check printing software, W2/1009 software and barcode generating software. It continues to grow with its philosophy that small business owners need affordable, user friendly, super simple, and totally risk-free software. A demonstration version of Halfpricesoft.com's ezW2 Software is available at http://www.halfpricesoft.com/w2_software.asp. Many larger companies invest in payroll software to help eliminate payroll errors. Payroll errors is not uncommon especially among companies that run their payroll the old fashioned way. The most common cause of payrolls errors is raw payroll data. This is information that is fed into the system. Inaccurate information will always lead to inaccurate, and erroneous payroll. This is typically caused by errors found on attendance sheets, and manual time cards. Many programs have built in features that totals up work hours, overtime hours, paid vacation hours, and holiday pay. The confusion comes in with having to add and subtract partial, or fractional hours worked. Payroll Processing Software is usually very accurate in its' computation of math problems, and leaves no room for errors. The software adds up point "0" hours such as: .5, 0.16, without any problems whatsoever. It can even print out a history of payments allowing the company to see if anyone has been overpaid or underpaid. may need to be edited, or corrected to ensure continued, problem free, booking keeping errors. It's easy for a companies accounting can get off track with raw data input, but having the right software that is not hardware dependent is a must for every payroll officer. It is preferable that companies who process any type of payroll use and automated system. An automated system has many features and luxuries that can implemented into any existing system that is already actively in use by the sponsoring company. It should be easy to use, and adaptable to what the company needs. Every company have different payroll needs, and finding a software that offers everything in one convenient package is truly a must have. Many large companies spend thousands of dollars each year on separate payroll software that proves to be unsatisfactory. A good payroll software program will also compute income taxes that may be owed to state, and federal agencies. It also prepare and print out W2's, and W4's. Finding the right software is not always easy, but it can be if companies know what they want. Some programs offer a 30 or 90 day free try before you buy deal. This way if the software package is not quite what's needed no one is out of pocket or disappointed. If the software fits the bill then the search is over. The next step is to purchase the product key code to continue using the software without any breaks in payroll processing. WASHINGTON (AP) -- The Obama administration is proposing that banks report all electronic money transfers in and out of the country, expanding its anti-terrorism requirements for financial institutions. Officials at the Treasury Department's Financial Crimes Enforcement Network said Monday that the new requirement would boost their ability to track the source of funding for terrorists. Currently banks are required to only report cash transactions above $10,000. They are also required to keep records on all electronic transfers of money in and out of the country above $3,000 and provide that information to law enforcement officials if asked to do so. James H. Freis Jr., the director of the Treasury agency, said that widening the reporting requirement would provide benefits with only a "modest cost to industry." "This regulatory plan will greatly assist law enforcement in detecting and ferreting out transnational organized crime, multinational drug cartels, terrorist financing and international tax evasion," Freis said in a statement announcing that the proposed rules were being published in the Federal Register for public comment. The proposed expansion of reporting requirements would not take effect until 2012. Bank of America said in a statement that the proposed rule would be analyzed to determine the impact it will have on the bank and its customers. The new policy would fulfill requirements under the 2004 intelligence law, which gave federal agencies greater authority to monitor potential terrorist threats. Critics contend that requiring banks to report all money transfers involving foreign wire transactions would represent a massive expansion in government access to personal data. "It is an extraordinary overreach by the U.S. government," said Marc Rotenberg, executive director of the Electronic Privacy Information Center, a Washington-based organization on privacy rights. "This looks like a big electronic fishing expedition." He said the proposal would raise serious concerns in many European countries where banking customers have greater privacy rights with regard to their financial transactions. Under current requirements, financial institutions each year file about 14 million reports on cash transactions in excess of $10,000. The proposed rule will not apply to credit card or ATM transactions, the most common ways that banking customers gain access to their funds when they are in another country. AP Business Writer Pallavi Gogoi contributed in New York to this report. If you have employees making more than $500,000 who are subject to New York City withholding, revised withholding tax computation rules may affect your payroll made on or after September 1, 2010. Calculate new withholding tax amounts using Publication NYS-50-T.2, Revised New York City Withholding Tax Computation Rules. A new Form IT-2104, Employee's Withholding Allowance Certificate, is also available. Employers should begin using the revised Form IT-2104 immediately. To avoid penalties, it's important to file and pay withholding tax on time and accurately report employee wage and withholding information. See Publication NYS-50, Employer's Guide to Unemployment Insurance, Wage Reporting, and Withholding Tax for more information. How to print MICR checks at $0 cost? Do you know you are able to print your bank checks from your home printer? And the cost can be as low as $0. Free offers of MICR check software and check paper. Watch step by step guide on How to Print MICR Bank Checks at $0 Cost at YouTube. So you've decided to get new payroll software for your company. That can be an important decision for your company. The wrong payroll software can be a waste of your time and limit your options as your company grows. But how do you know whether the software you're thinking about buying won't be just as frustrating or limiting as the software you currently have? First off, you probably have some features in mind that the new software must have in order to work for you. This is a good place to start. If your current software can't perform a function that you want to be able to use, check the product descriptions of your prospective software titles to make sure you buy software with the feature you need. For example, perhaps your current software only prints checks with the check-at-top format and you need to change to check-in-the-middle or check-at-bottom format. Or maybe you need software that allows flexibility for different kinds of deductions. But don't stop your list with just the things you want to be able to do that you can't do now. You also want to list every feature and function that you currently use. Don't assume that they are included in all payroll software. Some are not. Once you have your list of features, identify which features you absolutely must have. Any product that doesn't have one of these features should not even be considered. The rest of your list are optional features—features that would be nice to have or will make your job much easier if you have them, but ultimately you could live without them if you have to. Rank your optional features according to their priority. Put a "1" next to the features you feel are most important. Put a "2" next to features you'd like to have if all your number 1 features are met. Put a "3" next to features that are convenient, but optional and a "4" next to those that would be nice to have, but won't really affect your decision making. If you plan to change to a new payroll software in mid-year, make sure you purchase payroll software that lets you enter year-to-date payroll data for your employees. You don't want to get stuck spending hour after hour entering data for each pay period that has already occurred in the year. One of the most common reasons for deciding to change payroll software is that the software currently being used is too complicated and difficult to use. So you'll also want to look for a payroll solution that is easy to use. The key part here is the graphical interface—the window or screen that displays your options and accepts the data that you enter. Look for screen-shots of the product on the box or web site. Does the screen layout make sense to you? Can you find what you're looking for? If the layout makes sense to you and you can easily see the options you use most often, that's a good sign that the software will be easy to use. Tax rate tables change every year as tax laws change. Don't get stuck paying high fees to update your tax tables. Know ahead of time what you will be paying to get updated tax tables for your software ahead of time. If a company doesn't state clearly what that fee will be, chances are good that you'll be taken for a ride. The same is true for using your software for multiple businesses. Some software companies require you to purchase the software for each company. Don't buy software that limits your growth. The absolutely best way to determine if a payroll software will work for you and your company is to try it. Believe it or not, that doesn't mean you have to spend hundreds or even thousands of dollars on software you may not like. Reliable software developers who create quality products actually allow you to try their software for free. Buying new payroll software for your company shouldn't be a shot in the dark. Identify software titles that have all the features you currently use and would like to use. 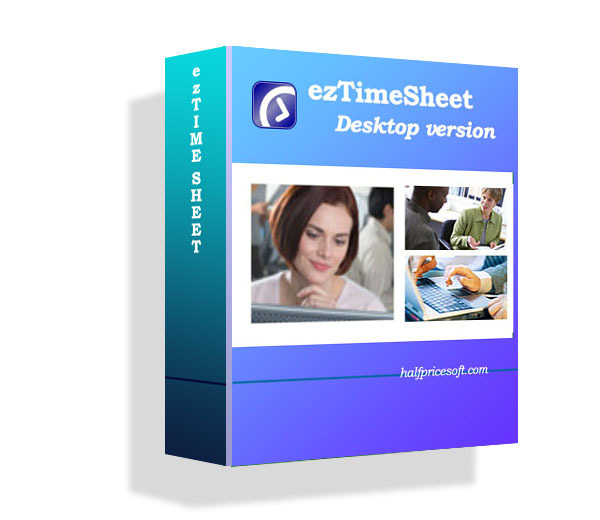 One software title that includes a variety of options for all these situations is ezPaycheck 2010 from Halfpricesoft.com. ezPaycheck is available for a free 30-day trial to ensure that it has the features your company needs before ever paying a dime. It's available for download at http://www.halfpricesoft.com. Taking a few minutes to answer important questions before purchasing payroll software will save years of headaches afterward. Have you considered all these options and features that you might need? Whether you're starting up a new company, making the jump from books to computer, or looking for replacement payroll software, it's important to get payroll software that is going to do everything you need it to and fit the needs of your company. Here are 15 questions to ask about any payroll software you are considering purchasing for your company. When you have answers to all these questions, you'll easily be able to identify the right payroll software. 1. Does this software have current tax information for your state? 2. Does this software have flexibility to add local tax info? 3. Will you need to options for pre-tax and/or post-tax deductions? 4. Will you be printing on blank checks or checks preprinted with your company and bank info? 5. Do you want to print signature images on checks or sign checks by hand? 6. Which tax forms will you need to print using your payroll data? i.e. Form 940, 941, W2, 1099, etc. 7. Does this software support your payroll period, i.e. daily, weekly, biweekly, semimonthly, or monthly? 8. Will you need to be able to calculate tips and or commissions? 9. Does this software support printing for the check format you prefer? 10. Does the software offer year-to-date payroll data entry? 11. What level of technical support does the software developer offer? 12. Will you need to do payroll for more than one company? 13. Does this software have a trial version you can test drive? 14. Are there any hidden fees? 15. Are database back-up and restore features included? Answering these questions will help you identify software titles that are likely to work well for your company. Taking extra time before you buy to get the features you need, will save you time and money while reducing frustration down the road.